The Cups and Balls is one of the oldest tricks in the world. 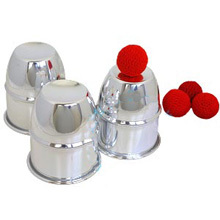 With them you can produce and vanish little balls and then produce three lemons instead. This is a trick that requires some sleight. Three small balls placed under three metal cups magically jump from cup to cup, vanish completely and reappear again under the magician's control! Complete with three aluminium cups, and 4 balls.